Match: Ghana 1, Australia 1. Location: There's Hope Barber Shop, 195 East 167th Street, Bronx. The Draw: $12 haircuts, $5 "Shape Ups," and a 42-inch Sony flat-screen with surround-sound speakers. Were Haircuts Actually Taking Place Saturday Morning? : Yes, but very slowly. 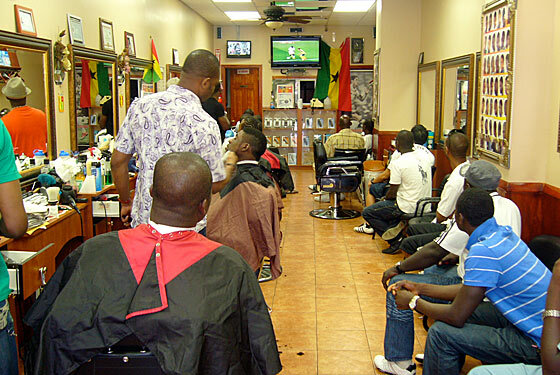 If the Ghanaian flag hanging in the storefront window didn't tip them off, the two-dozen heads inside pointed toward the TV should've been a warning to anyone in a real hurry to get shorn. Scene: John Preston, like many Ghanaians, lives a few blocks from There's Hope in the Morrisania section of the western Bronx. The 37-year-old taxi driver comes in for a trim every two weeks, but on Saturday he was just there for soccer. "I cannot watch by myself," said Preston, who was born in America but lived in Ghana from ages 3 to 23. "How Obama loves politics — he went straight from the state legislature to the Senate to president, so you know he loves it. That's how we love soccer." An odd choice of analogy, but Obama references are standard at There's Hope: There's an Obama clock, an Obama poster, and Obama $5 bills on the wall. When the Black Stars tied the game on a penalty kick, John started a "Yes We Can!" chant. At halftime, John went to a bodega for a bag of ginger ales, waters, and sweet Malta India sodas. "I have to make sure everybody is happy," he explained. The group camaraderie was instant: A New Yorker who'd adopted Ghana as his team — and had stopped in to watch the game on his way to Yankee Stadium — told me that when he went to see the team's first match at the Meytex Café in Brooklyn, several Ghanaians invited him to stay as a guest of their families if he ever makes it through the country. The match ended a draw and the crowd immediately began chanting: "Who is Germany? Who is Germany?" Ghana can guarantee passage to the next round if it can knock off Germany in its next match; the Europeans are heavily favored, but, of course, the Ghanaians still have hope. If you know of a good spot to catch a game with crazed nationals, let us know in the comments.